We can only ship to the same shipping address provided on your Paypal account due to Paypal protection policies. 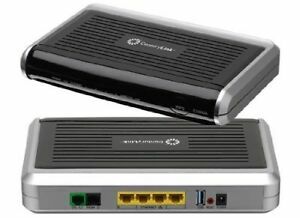 The only Centurylink modem worth paying for. This really isn't a good modem. It's underpowered. When I disabled the wireless to use my real router, the wired speeds out of it went up significantly. It's not super well built. It needs to be rebooted every couple weeks, because it cuts out sometimes at that point. That said, the more expensive available Centurylink modems aren't really much better, and cost significantly more. So if you've gotta get DSL instead of cable or fiber, whether for cost or because it's all that's available, I highly recommend this necessary piece of garbage. So far so good. The hook-up and activation were pretty easy, although I had to contact tech support to help me to get it to link with our Windows XP. Our wi-fi speeds seem to have improved some, although we are only able to upgrade to 5 mbps download. Purchased this one that was 6 months old, but came in near new condition along with the packaging, cables, and manuals. The modem worked well, however they sent the wrong power adaptor. It was 12V which was the correct voltage however the end that plugs into the modem was a bit too large. I had to go to town and buy a power adaptor that would fit because I did not want to wait for the vendor to send one in the mail. There are many different 12V power supplied I discovered because I had about a dozen from various electronic devices and none of them had the correct end so I had to go buy one. 37 feet down a hallway to the TV--only 3 bars for wireless signal. Sometimes 2 bars! I asked "goldbayusa" the seller " I only get 3 bars at 37 feet which is down a hallway to the TV. 4 days ago it started to give only 2 bars for awhile and go back to 3. Nothing has changed in the house. I'm replacing an UPVEL that always gave 5 bars continuously. It was a much cheaper unit new at $42.00. I believe this Zyxel retails for around $95.00. Is this normal for this Zyxel unit. They answered "Hello Sir. All our items has been tested with our technician guy before to ship." CenturyLink said 3-5 bars is good. Tried to help but nothing changed. So if you have obstructions, multi levels, longer hallways (37 ft isn't far) you might think about this one.